Is Chipotle Mexican Grill, Inc. (NYSE:CMG) a good investment right now? We check hedge fund and billionaire investor sentiment before delving into hours of research. Hedge funds spend millions of dollars on Ivy League graduates, expert networks, and get tips from industry insiders. They sometimes fail miserably but historically their consensus stock picks outperformed the market after adjusting for known risk factors. Several hedge funds sold out of Chipotle Mexican Grill, Inc. (NYSE:CMG) in Q3, as there was a net decline of 6 hedge fund shareholders. While Chipotle shares have had a big bounce-back in 2018, which may have prompted some of the stock’s newer investors to take their gains and move along, billionaire Bill Ackman believes the stock still has plenty of runway left. “Although the stock is up 68% year-to-date, it is worth noting that Chipotle shares were trading near current levels as recently as June 2017, despite progress made by Brian Niccol, the additional investment of over $300 million of capital expenditures to build 124 net new stores and significantly upgrade the 8 company’s digital capabilities, and the enactment of corporate tax reform which has increased the value of every pretax dollar the company earns by more than 15%,” Ackman wrote in Pershing Square’s Q3 investor letter. How have hedgies been trading Chipotle Mexican Grill, Inc. (NYSE:CMG)? At Q3’s end, a total of 33 of the hedge funds tracked by Insider Monkey held long positions in this stock, a decline of 15% from the previous quarter. 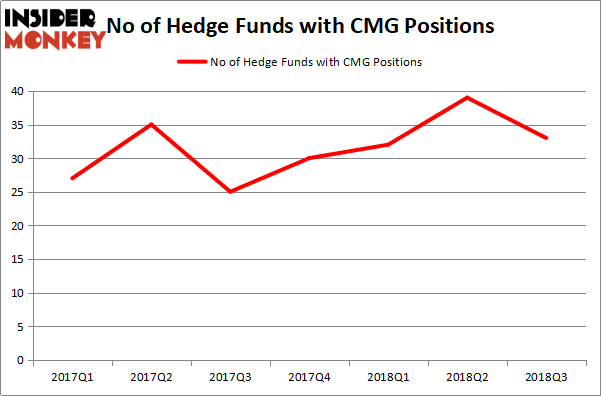 On the other hand, there were a total of 30 hedge funds with a bullish position in CMG at the beginning of this year. So, let’s find out which hedge funds were among the top holders of the stock and which hedge funds were making big moves. 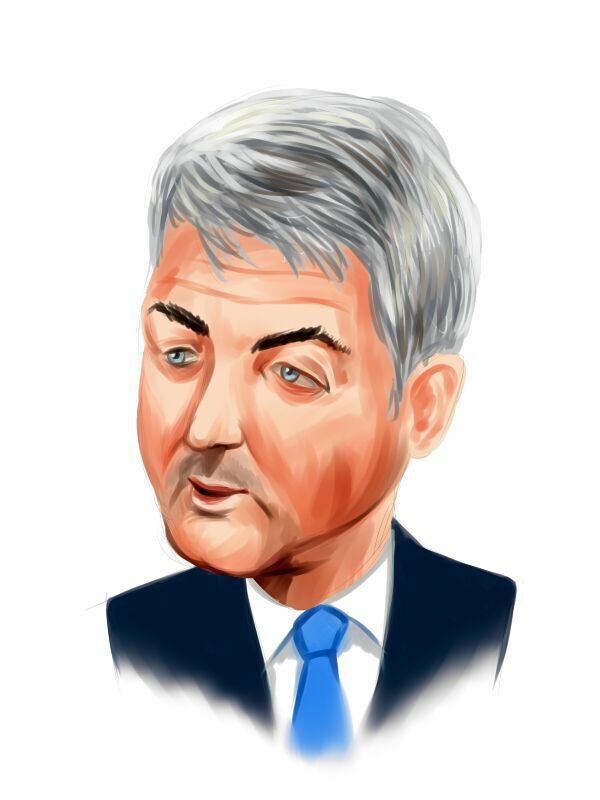 The largest stake in Chipotle Mexican Grill, Inc. (NYSE:CMG) was held by Bill Ackman’s Pershing Square, which reported holding $935.9 million worth of stock as of the end of September. It was followed by Renaissance Technologies with a $360 million position. Other investors bullish on the company included Citadel Investment Group, Generation Investment Management, and Two Sigma Advisors. Because Chipotle Mexican Grill, Inc. (NYSE:CMG) has witnessed falling interest from the aggregate hedge fund industry, it’s easy to see that there is a sect of fund managers that slashed their entire stakes in the third quarter. At the top of the heap, David Greenspan’s Slate Path Capital cut the largest stake of the 700 funds monitored by Insider Monkey, worth about $174.7 million in stock. Christopher A. Winham’s fund, Tide Point Capital, also dropped its stock, about $49.3 million worth. These transactions are interesting, as aggregate hedge fund interest dropped by 6 funds in the third quarter. Let’s now take a look at hedge fund activity in other stocks similar to Chipotle Mexican Grill, Inc. (NYSE:CMG). These stocks are Telecom Italia S.p.A. (ADR) (NYSE:TI), DexCom, Inc. (NASDAQ:DXCM), GrubHub Inc (NYSE:GRUB), and The Mosaic Company (NYSE:MOS). All of these stocks’ market caps are closest to CMG’s market cap. As you can see these stocks had an average of 26 hedge funds with bullish positions and the average amount invested in these stocks was $850 million. That figure was $2.03 billion in CMG’s case. GrubHub Inc (NYSE:GRUB) is the most popular stock in this table. On the other hand Telecom Italia S.p.A. (ADR) (NYSE:TI) is the least popular one with only 3 bullish hedge fund positions. Chipotle Mexican Grill, Inc. (NYSE:CMG) is not the most popular stock in this group but hedge fund interest is still above average. This is a slightly positive signal but we’d rather spend our time researching stocks that hedge funds are piling on, like GRUB.